For millennia physicians have cured the sick and treated the ill, oftentimes experimenting on their patients and developing new medical treatments. However, for the past fifty years a dichotomy has been forming between the role of physicians who treat patients and researchers who pioneer new therapies. A 2013 study by the Journal of the American Board of Family Medicine found that just one percent of physicians say they devote more than 10% of their time on research. Ninety-five percent of family physicians said they do not do any research at all. Currently, most researchers at biomedical research institutions brandish Doctor of Philosophy degrees (PhD’s) instead of Doctor of Medicine degrees (MD’s), leaving them without experience in medicine or treating patients. Similarly, most physicians nowadays are opting to apply for internships right out of medical school instead of pursuing a PhD. Why has the number of physician-researchers been silently yet precipitously plummeting for the past 50 years? What are the benefits and drawbacks of this siloed approach to patient care? And what are the challenges that face those medical professionals who decide to pursue both disciplines? Since the dawn of humanity people have been trying to cure the sick, mostly with magic and a splash of serendipitous intuition. The ancient Egyptians mastered the the use of herbal remedies and widely used spells and incantations in attempts to cure the sick. In overcrowded labor camps, workers were often fed diets composed mainly of radishes, garlic, and onions—vegetables rich in powerful natural antibiotics to ward off disease such as raphanin, allicin, and allistatin. Greek physician Hippocrates was the first to implement the concept of diagnosis and prognosis, and describe illnesses as acute, chronic, endemic, or epidemic. Most importantly, he introduced the concept of advanced medical ethics to the west when he famously penned the Hippocratic Oath in the 5th century BC, in which physicians vow to adhere to strict ethical standards. The Hippocratic Oath is still recited by physicians upon graduation from medical school. In comparison to these ancient traditions of medicine, the scientific method has come into practice very recently during the 17th century. Even during the climax of the Scientific Revolution, the scientific method was applied predominantly to physics, chemistry, and physiology. Immunological research would have to wait until the late 19th century after Louis Pasteur proved that infectious diseases were caused by microorganisms like bacteria, fungi, protists, and viruses. During the first half of the 20th century many physicians began applying the scientific method to study their patients and the diseases that infected them. It is during this time that physician-scientists made some of the greatest discoveries in modern medicine including the isolation of insulin, and the creation of the MMR vaccine, contraceptives, and anesthesia. However, throughout this explosion of discovery, the majority of physicians conducted their research with thoughtful consideration of their patients, there were few ethical standards that required doctors to experiment in the best interest or with the informed consent of the patient. The Tuskegee Syphilis Study of 1932 in which physicians from the U.S. public Health Service surreptitiously infected hundreds of healthy African-American men with syphilis under the guise of receiving free healthcare from the U.S. government. Human radiation experiments conducted by the United States Department of Defense during the Cold War in which government doctors fed radioactive material to mentally disabled children, irradiated prisoners against their will, and exhumed bodies without consent from the families of the deceased to perform experiments. And Project MKULTRA of 1953 in which the United States Central Intelligence Agency (CIA) in part with over 80 institutions, including 44 colleges and universities, tortured and drugged thousands of participants in the pursuit of a mind control technique for interrogations. Unconscionable experiments such as these were widely kept under wraps until the horrific experiments of Nazi physicians on unconsenting concentration camp prisoners came to light during the aftermath of World War II. In the epilogue of the Nuremberg Military Tribunal, the “Doctor’s Trials” of 1947 raised fervent concerns surrounding the ethical conduction of research and prompted the creation of research ethics committees such as America’s Institutional Review Boards. In 1974, Congress passed the National Research Act which created the National Commission for the Protection of Human Subjects of Biomedical and Behavioral Research. Four years later, the commission published the Belmont Report, which outlined the boundaries between practice and research, the basic ethical principles of informed consent, and the assessment of risk and benefits in human research studies. Though these regulations made monumental strides in patients’ rights, they also significantly decelerated the pace of medical research. Now, even if physicians were certain that an experimental procedure or drug would act in the best interest of a patient, they needed to present years of data based on all available testing, including ex vivo experiments and animal studies, to review boards—and that’s just to perform the first human trial. As the scale of medical research transitioned from months to decades, practicing physicians found it increasingly difficult to devote exorbitant time to research. Under these new regulations, researchers required years of extensive training and fellowship that medical school alone could not provide in order to pursue a career in academia. 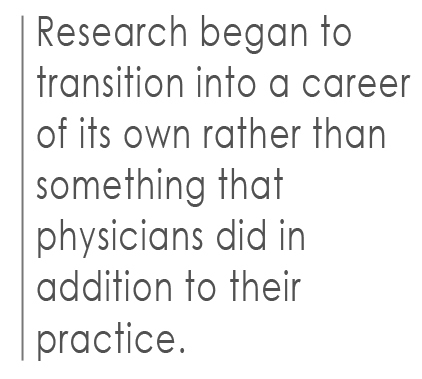 Research began to transition into a career of its own rather than something that physicians did in addition to their practice and undergraduates whose preoccupation was with research began opting out of medical schools and applying to PhD programs. Between 1998 and 2008, the amount of science PhDs earned grew by nearly 40% and this exponential growth shows no sign of slowing. This all being said, many medical students still desire a career working with patients as a physician as well as exploring their areas of interest through rigorous scientific research. However, the necessity of obtaining both an MD and a PhD is a financial and time consuming burden that many students can not afford, no matter how ambitious they are. Most medical school graduates are increasingly electing to transition directly from medical school to lucrative medical internships instead of pursuing (and paying for) a PhD which usually takes an additional four years of work. At the same time, research funding from the National Institute of Health has been steadily declining since 2003. And grants, which fund both scientists’ research and their salary, are becoming increasingly more difficult to obtain. 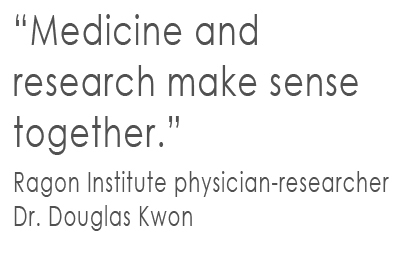 For those willing to take on the challenge, there is fertile ground for the taking between medicine and research. Being a modern physician-researcher offers a unique opportunity to ask questions that are the most relevant for the direct improvement of patient care. For more information on the life of a modern physician-scientist listen to “Clinician-researchers in the world of bench-to-bedside medicine” on Inside Ragon, the official podcast of the Ragon Institute of MGH, MIT, and Harvard. Available on iTunes and Soundcloud. Liam is a lifelong resident of Boston and is currently enrolled at the University of Massachusetts in Amherst majoring in Biochemistry and Molecular Biology on a pre-medical track. In his freshman year at UMass, Liam was elected the House Council President of the UMass Northeast residential area and was selected as one of fifteen members of the inaugural Biology Major Advisory Committee. Last year, Liam authored and published a book titled Through the Eyes of Our Neighbors which explores the differing identities of Boston as it pertains to people of different racial groups, socioeconomic classes, and nationalities through portraits and interviews collected from over 70 people. This summer, Liam is working full time at the Ragon Institute of MGH, MIT, and Harvard alongside Sarah Sullivan and Dr. Sylvie Le Gall as a liaison between the research laboratories and communications department. For personal inquires, email Liam at lsfitzgerald@umass.edu. 2.) “Edward Jenner & Smallpox”. The Edward Jenner Museum. Archived from the original on 28 June 2009. 3.) Brock, Thomas. Robert Koch: A life in medicine and bacteriology. ASM Press: Washington DC, 1999. Print. 4.) Voorhees, J. R., I. M. Xierali, A. W. Bazemore, R. L. Phillips, C. R. Jaen, and J. C. Puffer. “A Small Percentage of Family Physicians Report Time Devoted to Research.” The Journal of the American Board of Family Medicine 26.1 (2013): 7-8. Web. 5.) Aboelsoud, N.H. (2010). Herbal Medicine in Ancient Egypt, Journal of Medicinal Plants Research, 4(2), 82-86, 18 January, DOI: 10.5897/JMPR09.013. 6.) Loudon, Irvine (2002-03-07). Western Medicine: An Illustrated History. Oxford University Press. ISBN 978-0-19-924813-1. 7.) “Tuskegee Study Timeline”. NCHHSTP. CDC. June 25, 2008. 8.) The Plutonium Files: America’s secret medical experiments in the Cold War, by Eileen Welsome, Dial Press, c1999, New York, N.Y., ISBN 0-385-31402-7. 9.) “Project MKUltra, the Central Intelligence Agency’s Program of Research into Behavioral Modification. Joint Hearing before the Select Committee on Intelligence and the Subcommittee on Health and Scientific Research of the Committee on Human Resources, United State Senate, Ninety-Fifth Congress, First Session” (PDF). U.S. Government Printing Office (copy hosted at the New York Times website). August 8, 1977. 10.) National Commission for the Protection of Human Subjects of Biomedical and Behavioral Research, Department of Health, Education and Welfare (DHEW) (30 September 1978). The Belmont Report (PDF). Washington, DC: United States Government Printing Office. 11.) Cyranoski, David, Natasha Gilbert, Heidi Ledford, Anjali Nayar, and Mohammed Yahia. “Education: The PhD Factory.” Nature.com. Nature Publishing Group, 20 Apr. 2011. Web. 12.) Meador, KJ. “Decline of Clinical Research in Academic Medical Centers.” Neurology 85.13 (2015): 1171-6. National Center for Biotechnology Information. U.S. National Library of Medicine, 8 July 2015.